The aim of the joint project Seronet is to bring commercial service robot systems onto the market more efficiently and quickly. To this purpose, an online contact platform has been created enabling component manufacturers and integrators to develop systems for end users. Since all protagonists cooperate via the platform and the hardware and software offer unified interfaces, it is said to be possible to realise application-specific robot systems without numerous iterations. How this development can look, and how complete systems can be put together from modules, is shown by Seronet using a simplified logistics task. The central exhibits are the software tools for component and system development and the Seronet contact platform, on which future suppliers and users of service robot solutions can specify and realise collaborative projects. Visitors to the fair can try out the software tools and the platform live at two terminals and see the graphical operating surface. A platform lives by attracting numerous users. Seronet is therefore planning an appeal before the end of summer 2019 in which interested parties will receive incentives for participating in the platform. 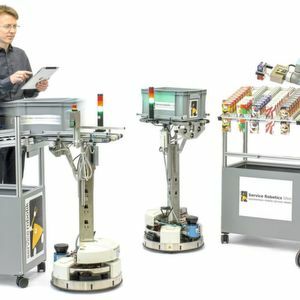 The aim is for component manufacturers to find new sales channels, for system integrators to gain customers for their services, and for end-users to receive ready-to-use service robot applications, the press release states. Visit Fraunhofer-IPA at Hannover Messe in Hall 2, Booth C28.